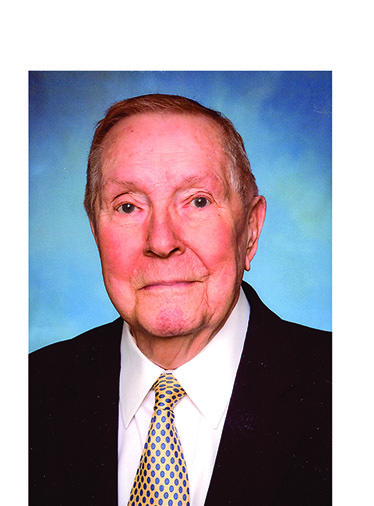 Home Obits GERARD FRANCIS THOMAS JR.
Gerard Francis “Sonny” Thomas Jr. died Feb. 10, 2018, at the age of 95. Gerard was born Jan. 20, 1923, from the marriage of Gerard Francis Thomas Sr. and Essie Herminghaus Thomas. His wife, Mary Jean Swift Thomas, to whom he was married Feb. 10, 1946, predeceased him Jan. 30, 2013. Sonny and Mary Jean were predeceased by their daughter, Marcia Thomas Pendleton, in 1981. A lifelong resident of Natchitoches, Gerard graduated from Natchitoches High School in 1939 and obtained his Bachelor of Arts Degree from Northwestern State University in 1943. Following military service and World War II, he earned his law degree in the spring of 1948 from Louisiana State University Law Center at Baton Rouge and was admitted to the practice of law Aug. 9, 1948. Gerard enlisted in the United States Marine Corp Reserve in November 1942 and was called to active duty in June 1943. After completing the USMC Officer Candidates School at Quantico, Va., he went on to serve as Infantry Officer and Platoon leader with K Company, 3rd Battalion, 8th Regiment, 2nd Marine Division, during 1944 and ‘45 in the Pacific theatre of operations. He participated in the invasions of Saipan, Tinian, Okinawa and the occupation of mainland Japan at the conclusion of the war. He was honorably discharged as a 1st Lieutenant from the USMCR in July 1949 and from the Louisiana National Guard as a captain in April 1952. From over 50 years as a practicing attorney, Gerard will be remembered not only for his courtroom accomplishments but also his involvements in giving back to the legal profession. He served as a member of the Louisiana State Bar Association House of Delegates for more than 35 years and on numerous other LSBA Committees designed to improve the legal system and to make delivery of legal services to the public more effective and affordable. Gerard served as Chairman of the LSBA Section on Admiralty and Insurance Law. He was a long-time member of the American Trial Lawyers Association and the Louisiana Trial Lawyers Association, serving as President of the LTLA in 1965-66. Gerard had interest and concern for the integrity of the legal profession and for the public confidence required for the judicial and legal system to succeed. He was a member of the Disciplinary Board of the LSBA from 1981 through 1991 and served as its Chairman in 1987. He also served on the Judiciary Commission of Louisiana from 1983 through 1987, serving as its Chairman in 1987. In 1985, Gerard was recognized for his time and effort he gave to the disciplinary process by being awarded the LSBA President’s Award. He remained on the LSBA Ethics Advisory Service Committee into his retirement continuing his interest in the Rules of Professional Conduct under which lawyers practice their profession. Gerard was inducted as a fellow of the American College of Trial Lawyers in 1979 and into the International Academy of Trial Lawyers in 1988. The American College of Trial Lawyers (ACTL) is composed of preeminent attorneys from the United States and Canada and fellowship is limited to only the top 1 percent of the total lawyer population of any state or province. Gerard’s 1979 ACTL induction represented the first membership awarded to an attorney in North Louisiana. Gerard was a lifetime fellow of the Louisiana Bar Foundation. Gerard was predeceased by two sisters, Rosemary Thomas Easley Baker and Frances Thomas Walker. He is survived by the following children and grandchildren, Gerard F. Thomas III and wife Elizabeth Hollier Thomas of Lafayette, and their children, Kathryn Thomas Ledet and husband Chris, and their child, Andrew; Stacey Engelbrecht Rufe and husband Chris and their children, Charlotte and Nora Rufe; and Stephen Engelbrecht and wife Kristin and their children, Annie and Luc; Richard S. Thomas and wife Denise Martin Thomas and their children, Sidney and Harrison; Jeffrey H. Thomas and wife Samantha Palanche, and his daughter Caroline Thomas White. He is also survived by Carol Glock Peterson, mother of Caroline, and Gabrielle Graves, daughter of Samantha; Robert C. Thomas and wife Tama Blanchard Thomas and their children, Clayton and Michael; Patrick S. Thomas and wife Kelly Dolan Thomas and their children, Patrick and Erin; Stephen G. Thomas, a resident of Holy Angels School in Shreveport; Lindsay Pendleton, granddaughter, child of the late Marcia Thomas Pendleton, and her son, Cooper Puryear. Gerard donated his body to science through LSU Health Sciences in Shreveport. A celebration of Sonny’s life will be March 23 at 4 p.m. at Merci Beaucoup Restaurant, 127 Church Street, Natchitoches.